Stickers with appealing designs and positive messages. A great way to reward students and liven up the classroom. 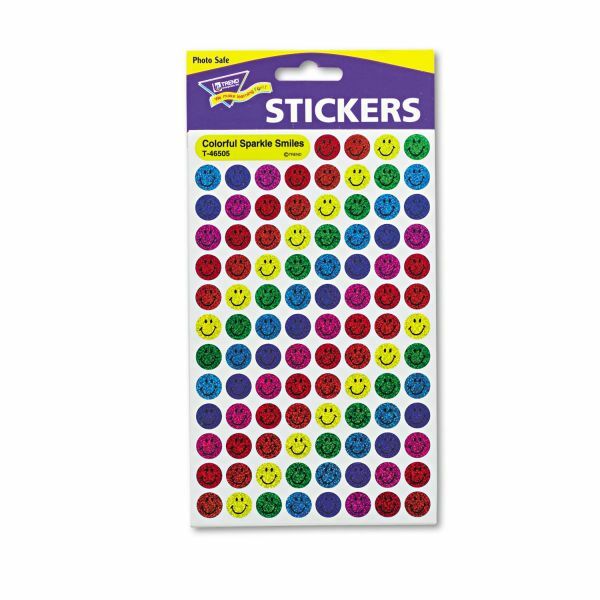 TREND SuperSpots and SuperShapes Sticker Variety Packs, Sparkle Smiles, 1,300/Pack - Sticker variety pack full of sparkly smiles is perfect for teachers, parents, and kids to motivate, reward, collect and trade. Chart-sized stickers are sized to fit Trend's Incentive Pads. Each self-adhesive sticker is acid-free, nontoxic, and safe for use on photos in memory books and scrapbooks. Colorful Sparkle Smiles Sparkle superSpots are ideal for teaching students in first-grade to fifth-grade and ages 6 to 11.